This book was my grief book. That may sound bad, yet you’ll note that I gave it five stars. I had unfinished business left buried deep down, while I lived an extremely busy life and dealt with other things. This book was my resolution. My mother died while my husband was near death, and while sitting by his bedside and urgently questioning doctors and searching his medical files to see what, if anything, they weren’t telling me, my mother, 200 miles south and 80 years old, was in intensive care. She had to be a side issue. I was glad my sisters were with her when she died, but because I was so intensively involved in my husband’s care and his ultimate recovery and my own little family at home, all I had time to do for my mother was to phone her briefly to say I loved her, and have quick conversations with my sisters regarding critical decisions that had to be made. A year and several months later, a friend and administrator at the middle school where I taught recommended this book to the whole staff, and when she asked who would like to borrow it, my hand shot up. I should point out here that I am an Atheist. But many times, we read fiction and we buy into a premise that we would not adopt in ordinary life. 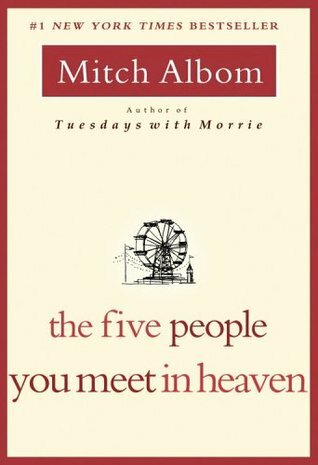 So it is with Albom’s heaven, and its five greeters. And on the last page, to my absolute astonishment, I burst into tears and grieved for my mother. I had thought that I was finished grieving; after all, she was quite elderly, and had been in poor health for quite awhile; her death was hardly unexpected. But I was very much mistaken. Our mother is our mother, and it’s likely to pack a punch when she goes. I still don’t believe in an afterlife; I put my faith in humans, and so far it’s worked out well for me. It makes sense to base our beliefs on the material world, and to realize that the bad things that do happen are due to material conditions rather than some almighty hand from who-knows-where deciding to zap us. When people tell me that everything happens for a reason, I generally don’t say anything, but I don’t believe it for a minute. Sometimes bad things just happen. Period. But once in awhile, when a loss is powerful and visceral, it can take the edge off of the sorrow or in the case of young people who die suddenly, the stark horror, if we pretend for a little while that we will someday meet again. It’s only natural to wish for such a thing. You will notice there’s no place on this page wherein I thank the publishers and some other source for a free galley. There wasn’t one. A friend figured out that I should read this book, and she loaned it to me. It was the right book at the right time. If you have unfinished business, or even just like a good three-hanky cry, this might be a gentle way for you to get there. This may not be “the” grief book for everyone, but it deserves strong consideration. It is an enormous consolation for some of us when there has been too much loss at one time, and we have had to be a little too strong. This entry was posted in Three-hanky narratives and tagged dying, grief, heaven, human nature, loss by seattlebookmama. Bookmark the permalink.